We invite you to explore India - the Land with infinite beauty ! Whether you soar high into Himalayas or peer under the ruins of the Ancient monuments dotting the landscape of India, you will cherish the experience long after your visit ! 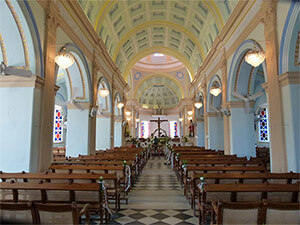 This India Travel Guide on Church of Our Lady of Angels is free from any commercial interest! This site is dedicated to promote India - the vast subcontinent, its glorious past, magnificent landscape and its infinite variety. The Church of Our Lady of Angels or Eglise de Notre Dame Des Anges as it is called in French, looks over the Bay of Bengal in the east facing the rising sun. It was built between 1851 and 1855 of 'Neopolitan Pink' stone and the work was overseen by the French Engineer Louis Guerre, a descendant of a family who has been in Pondicherry since the 18th century. Guerre also built the presbytery and other fine houses in the area. The original church of our Lady of Angels was built in 1707 in its current position - 3,Rue Surcouf, a small lane jostled in between the Rue Dumas and Rue Rolland, after the arrival of the first Governor General of French India (Pondicherry) Francois Martin, in 1674. This first church eventually became too small and when it was falling into disrepair, a second church was built in its place between 1739 and 1758 during the glorious years of Governor Dupleix. In 1761 this church was razed to the ground by the English as was the rest of the French city. 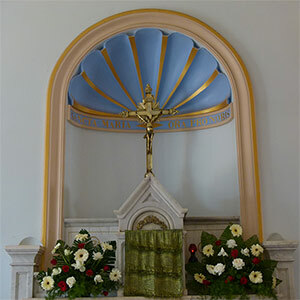 Another chapel was provisionally used until the completion of the existing building. 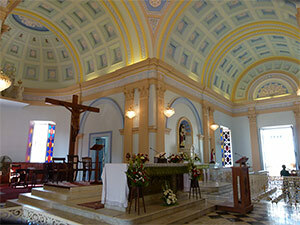 Traditionally the Church has always housed a priest of French origin and today it is the residence of Tamil/French priest Father Michael John Antonysamy. 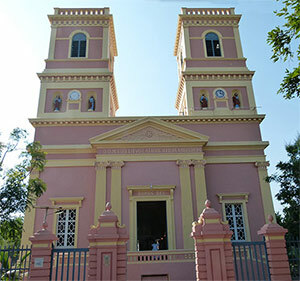 Our Lady of Angels is the only Church in Pondicherry where Mass is celebrated every Sunday in all 3 of the city's languages - French, English and Tamil. Archdiocese of Pondicherry and Cuddalore takes pains to see that this church has been entrusted to a priest who can speak these 3 languages. 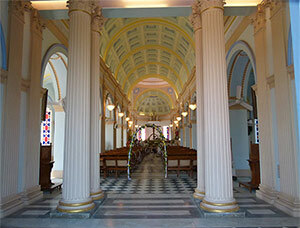 The church along with the Garden of Joan of Arc were renovated largely owing to the help provided by the Friends of Pondicherry Heritage - an association for the preservation of Pondicherry and French heritage in India. The exquisitely worked side Altar has a gold plated crucifix against the backdrop of gilt etched words - 'Sancta Maria Ora Pro Nobis' (Holy Mary Mother of God Pray for Us). This magnificent limestone church is modelled after the Basilica of Lourdes with its hugh central dome and gilt edged altars. The front carries the Latin invocation 'Dominae Angelorum' (actually 'Lady of Angels' in English) part of 'Ave Regina Caelorum' (Hail Queen of Heaven) - Marian Hymns, a Roman Catholic tradition. On the left side of the altar, there is a statue of the Mother of Immaculate Conception. You will find the French legend in the pedastal - "Je Suis L'immaculee Conception". Many of the life size statues of these French built churches were brought from France or Belgium.